WASHINGTON- Space Exploration Technologies (SpaceX) announced Jan. 16 that it plans to attemptitssecond launch of the Falcon 1 rocket within the week. The Falcon1's first flight, conducted last March, endedin failure [image].The rocket achieved only 30 seconds of powered flight before an engine firetraced back to a corrodednut brought the mission to an abrupt and premature conclusion [image]. 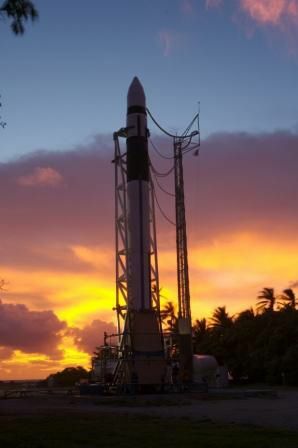 In anupdate posted on the El Segundo, Calif.-based company's Web site, SpaceX CEOElon Musk said the Falcon 1 is on the pad at the company's private launchcomplex in the KwajaleinAtoll in the Pacific Ocean and is being readied for a static fire testcurrently planned for Jan. 18 [image].If all goes smoothly, according to Musk, SpaceX will attempt to launch during atwo-day window that opens Jan. 21. He also said that SpaceX is working withrange officials "to secure a couple of additional days as contingency." "Should wego beyond that, which is still a good possibility as we work with the upgradedvehicle, pad, and procedures, the next available launch window ismid-February," Musk wrote. Theupcoming launch is a demonstration flight paid for by the U.S. Defense AdvancedResearch Projects Agency (DARPA), which also paid for the Falcon 1's debutlaunch. Musk said arecently completed Flight Readiness Review concluded that the rocket, groundequipment and launch team are ready to go. "Theupgrades to the vehicle, Kwajalein launch facilities and our launch procedureshave proven quite effective, and we have had a relatively smooth launchcampaign up to this point," Musk wrote. "A number of non-critical issuesarose during the wet-dress [rehearsal] and are being resolved, but we have seennothing to date that should delay our launch schedule."